Prepare to unwind and relax with our beautiful colouring series for adults! The series will focus on different and unique designs in every issue from animals, mandalas and sea life to gardens, fairies and shapes. Let the captivating designs draw your attention away from the demands of everyday life and de-stress with this wonderful colouring experience. 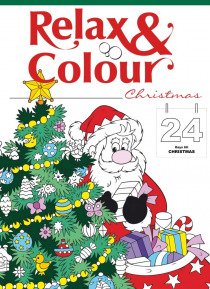 Welcome to our Christmas special edition!… Colour each day and make your way through the 24 days of Christmas. Count down to the most wonderful time of the year!